The planning application for the controversial Park & Ride scheme at Stourton will come back to the City Plans Panel next Thursday (24 January 2019). As previously reported on South Leeds Life, Councillors on the panel agreed in principle to the scheme, but blasted officers for lack of information in their report. A further report seeking to address the Councillors’ concerns has been published ahead of next week’s meeting. If agreed, the scheme will feature a 1200-space car park on the green space between Hunslet Cemetery and junction 7 of the M621, plus a one-storey terminus building and landscaping, and significant alterations to the motorway junction and to Low Road in Hunslet. 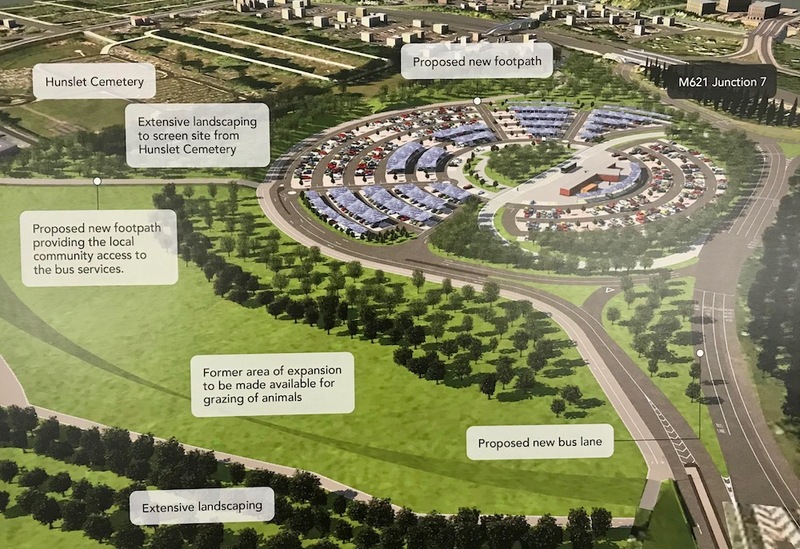 The new report states that landscaping plans have been improved to both create a better buffer between Hunslet Cemetery and the Park & Ride, and to plant more trees within the car parking areas to soften the view of hardstanding. Changes to the terminal building include a ‘green roof’ and solar panels as well as the inclusion of a Changing Places disabled toilet. “There’s very little that’s different in the new report, but we are very concerned that neither the MP nor the three local Councillors for Middleton Park ward have commented on this scheme. Our Councillors have done nothing to mitigate the impact of bringing 1200 cars into a residential area. Local people won’t forget that.